These options can help you hear better in certain situations, such as amplifying a telephone ringer, the sounds on a TV, people talking, or the audio from mobile devices. [MUSIC PLAYING] Best Buy carries a number of amplification devices. And while they're not designed to replace traditional hearing aids, they can assist in certain situations. For instance, if hearing the phone is a challenge, a product that amplifies the ringer can help. They plug into your existing landline phone and often have a strobe light for an additional visual cue. Or there are phones that have these assisted features built right in. If hearing the TV is an issue, using a wireless speaker like this TV sound box amplifier to help bring the sound closer to you is one way to go. Or there are personal amplifiers. They use an omnidirectional microphone to help pick up TV audio, people talking, whatever you point it at. For a more high-tech option, check out the Quattro from ClearSounds. You wear it around your neck, and it connects via Bluetooth to your hearing aids, cochlear implants, or earbuds. Plus, it has a removable Bluetooth mike. It's a great feature that can help you hear conversations in noisy environments. Finally, if you're in the market for new headphones, check out this unique ear free option from AfterShokz. They transmit sound through your cheekbones to your inner ear. So there's nothing in, on, or covering your ears. Pretty cool. That's a quick overview. 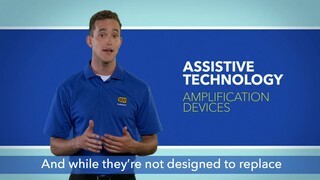 For more amplification devices and other assistive technology products, visit bestbuy.com/assistivetechnology.